The Great Lakes/Seaway System is a ‘marine highway’ that extends some 3,700km from the Atlantic Ocean to the Great Lakes. Approximately 160 million tonnes of cargo travels over the combined Great Lakes/Seaway System on an annual basis, supporting over 227,000 jobs and $35 billion in economic activity. The binational St. Lawrence Seaway serves as the linchpin within the Great Lakes / Seaway System, connecting the lower St. Lawrence River to the Great Lakes. Beginning in Montreal and extending to points west, the Seaway’s 15 locks (13 Canadian and two US) enable ships to climb a total of 168 metres from ‘sea level’ up to Lake Erie. The Saint Lawrence Seaway Development Corporation is a wholly owned government corporation created by statute on 13 May 1954, to construct, operate and maintain that part of the St. Lawrence Seaway between the Port of Montreal and Lake Erie, within the territorial limits of the United States. Trade development functions aim to enhance Great Lakes/St. Lawrence Seaway System utilization without respect to territorial or geographic limits. The mission of the Corporation is to serve the US intermodal and international transportation system by improving the operation and maintenance of a safe, reliable, environmentally responsible deep-draught waterway, in co-operation with its Canadian counterpart. The SLSDC also encourages the development of trade through the Great Lakes Seaway System, which contributes to the comprehensive economic and environmental development of the entire Great Lakes region. The SLSDC headquarters staff offices are located in Washington, DC Operations are located at the two US Seaway locks (Eisenhower and Snell) in Massena, NY. The St. Lawrence Seaway Management Corporation is a not-for- profit corporation responsible for the safe and efficient movement of marine traffic through the Canadian Seaway facilities, which consists of 13 of the 15 locks between Montreal and Lake Erie. The Corporation plays a pivotal role in ensuring that the waterway remains a safe and well-managed system, which it shares with its American counterpart, the Saint Lawrence Seaway Development Corporation. The Corporation's mandate promotes efficiency and responsiveness to the needs of shipping interests, ports, marine agencies, and provincial and state jurisdictions. The two Seaway entities coordinate operational activities particularly with respect to rules and regulations, overall day-to- day operations, traffic management, navigation aids, safety, environmental programmes, operating dates, and trade development programs. The unique bi-national nature of the System requires 24-hour, year-round coordination between the two Seaway entities. With water temperatures well above the ten-year average, the St. Lawrence Seaway closed its 2015 navigation season ice free on 31 December. Thirty-six million tonnes of cargo transited the waterway during the season, with grain, at volumes well above the five-year average, leading the way. The Seaway once again proved to be a key asset for farmers as they shipped their crops to markets at home and overseas. Grain volumes on the Seaway amounted to 10.8mt (million tonnes), one of the strongest years in recent memory. The Port of Thunder Bay, the principal point of entry for grain into the Great Lakes/Seaway System, reported its second-best season in 15 years. Combined with grain being loaded onto ships from other ports such as Hamilton, Duluth/Superior and Toledo, agricultural commodities have become increasingly important to the Great Lakes/Seaway System. In May, the SLSMC received the Promising Innovation in Transport Award from the International Transport Forum at the OECD, during the 2015 Summit of Transport Ministers held in Leipzig, Germany. The award recognized the SLSMC’s pioneering work in developing, with the supplier Cavotec, the world’s first Hands-Free Mooring (HFM) system for ships transiting locks. The use of this equipment will largely replace the traditional practice of manually securing ships in locks with steel mooring lines, enabling the Seaway to orchestrate gains in operating efficiency and safety, and become yet more competitive. The 2015 season opened on 2 April, about a week later than usual, reflecting the frigid conditions in early spring, and closed on 31 December with the passage of the vessel Mississagi through Welland Canal Lock 1 at 3:41am. The last vessel to exit the Montreal/Lake Ontario section was the Baie St. Paul, which exited the St. Lambert Lock at 8:41pm on 30 December. The 2015 navigation season was 274 days in length. “Now that the navigation season has concluded, winter maintenance projects at the US Snell and Eisenhower locks are already underway. The maintenance of the US locks is a year round job and Seaway employees are diligently working as we continue to rehabilitate and modernize the Seaway infrastructure under our Asset Renewal Program” said Betty Sutton, Administrator of the US Saint Lawrence Seaway Development Corporation. The Coast Guard Authorization Act of 2015 authorizes another heavy icebreaker for the Lakes, and the Senate’s Homeland Security Appropriations bill includes $2 million for initial survey and design work, but full funding for the $200 million vessel still needs to be approved. The Association is confident funding will come. “The new icebreaker has lots of horsepower behind it. In the House, Representatives Candice Miller (R-MI), Louise Slaughter (D-NY) and Sean Duffy (R-WI) are laser-focused on the issue. In the Senate, Senators Gary Peters (D-MI) and Tammy Baldwin (D-WI) are leading the way.” In addition to a second heavy icebreaker, the Association is calling for the US Coast Guard to accelerate modernization of its aging 140-foot-long icebreaking tugs by moving the work from its yard in Baltimore to Great Lakes shipyards. A Department of Homeland Security report on the need for a second Poe-sized lock to connect Lake Superior to the lower Great Lakes and St. Lawrence Seaway issued on 4 March forecasts almost 11 million Americans would lose their jobs if the Poe Lock were down for six months and the nation suffer a $1.1 trillion decrease in economic activity. Recently, several articles, editorials and letters have perpetuated exaggerations and inaccuracies about the Vessel Incidental Discharge Act (VIDA). The Lake Carriers Association (LCA) believes the public deserves the rest of the story. VIDA consolidates vessel ballast water regulatory authority under the US Coast Guard (USCG), confirms the current USCG ballast water regulations, and provides for a periodic process to upgrade the USCG ballast water discharge standard (BWDS) with input from states and the EPA. Some VIDA opponents claim it eliminates current requirements that vessels treat their ballast water, inferring that only judicial enforcement of the Clean Water Act (CWA) drives this requirement. Others claim this consolidation would make the Great Lakes vulnerable to more aquatic non-native species (ANS). Most cite the Lakes’ experience with zebra mussels as an example of what will happen. The LCA agrees that ANS introduced into the Lakes years ago caused harm, but the rest is hype. What they do not say is that Lakes ANS were all introduced before 2006, when the USCG, under a separate authority than the CWA, began requiring vessels entering the Lakes from outside US waters to exchange their ballast water with ocean water. Since then, no new ballast water-borne ANS were introduced into the Lakes, despite thousands of foreign vessels entering the Lakes since then. These articles, editorials and letters claim the USCG’s rules for treating vessel ballast water are too weak, but they are just beginning to be implemented so their effectiveness cannot yet be fairly assessed. Also, ballast water treatment is in addition to the Lakes’ already highly effective ballast water exchange requirement. Equally important, the USCG and the EPA independently determined that the technology doesn’t yet exist to meet a more stringent BWDS.VIDA opponents also claim VIDA would freeze the current USCG discharge standard. This is a wild exaggeration of VIDA’s process for reviewing and improving the USCG BWDS. Also, contrary to some statements, the USCG has far greater experience regulating vessel discharges and inspecting vessels than the EPA or the states. Some VIDA opponents claim its exemption from ballast water treatment for vessels serving only Lakes ports (lakers) will spread ANS among these ports. However, current EPA and USCG regulations already exempt lakers from ballast water treatment and instead require extensive best ballast water management practices. Since the USCG began requiring mid- ocean exchange for other vessels, lakers have discharged approximately 66 billion gallons of ballast water from the lower Lakes into Lake Superior waters. According to the EPA, US Geological Service, and National Oceanic and Atmospheric Administration, no ANS have been moved anywhere in the Lakes by lakers. Clearly, lakers are not the problem. Why is there opposition to VIDA? Some groups focused on general environmental goals see lawsuits against Federal, state, and private entities as their preferred mechanism of change and confuse competing and conflicting regulations with progress. However, laker operators were one of the first groups to sound the alarm on ANS. In 1993 the LCA instituted its own best management practices to prevent ANS inter-lake movement. Laker operators work with government agencies, universities, research institutions, and environmental and engineering experts to move the state of science and technology forward. The Federal government is establishing ballast water management technological standards, inspection and monitoring criteria, and enforcement capabilities. The LCA sees few signs that VIDA opponents are working equally hard for solutions that really work. CWA was specifically designed for fixed industrial facilities handling substances such as industrial wastes, sewage, and garbage, not the Lake water used as ballast by lakers. Commercial aircraft and trains do not have to meet varying equipment requirements for each state they serve or pass through; they meet nationwide Federal standards. Applying the same approach to vessels will not have a disastrous effect on the health of the Lakes; it will just reduce conflicting and redundant regulations that cost good-paying jobs and increase consumer prices. VIDA is well-reasoned, common sense legislation, and it will result in significant new protection against ANS threats. VIDA keeps the gate closed to aquatic non-native species and gives the Coast Guard, the agency who closed the gate, primary responsibility as our national invasive species gatekeeper. 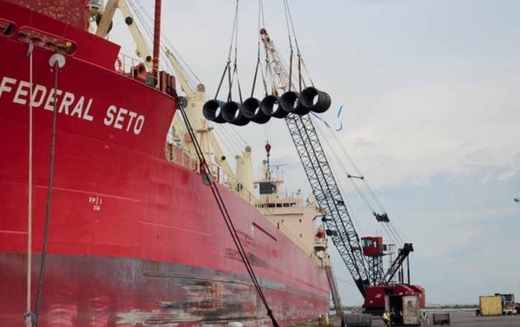 On 22 June, the Lee A.Tregurtha sailed from Fincantieri Bay Shipbuilding Company in Sturgeon Bay,Wis., becoming Interlake Steamship Company’s third self-unloading bulk carrier to be outfitted with exhaust gas scrubbers. Interlake became the first US-flag fleet to test scrubbers on the Great Lakes in April 2015 after pioneering the emission- reduction technology on its Hon. James L. Oberstar. Earlier in June, the James R. Barker sailed as the fleet’s first thousand footer with scrubbers. The retrofit of the Lee A.Tregurtha was supported by a $500,000 cooperative agreement from the US Department of Transportation’s Maritime Administration (MARAD). Exhaust gas scrubbers reduce sulphur emissions to a level that meets or exceeds North American Emissions Control Area requirements. Fincantieri Bay Shipbuilding handled the successful installation on the 806-foot Oberstar and was the clear choice to complete the second phase of installations on the 1,004-foot Barker and the 826-foot Tregurtha. Both the Lee A.Tregurtha and the James R. Barker are equipped with the same single-inlet, closed-loop DuPontTM Marine Scrubbers from Belco Technologies Corp. (BELCO), a DuPont company, that were installed on the Oberstar. Propelled by a long-term vision to create the most efficient and environmentally responsible fleet on the Great Lakes, Interlake is shoring up its ten-year, $100 million fleet modernization which includes the steam plant conversion program and the repower of its final vessel, the Herbert C. Jackson. Headquartered in Middleburg Heights, Ohio, the Interlake Steamship Company was launched in 1913. For more than a century, the company has led the Great Lakes shipping industry through its commitment to flawless service, environmental stewardship and continuous innovation. ISO 9002 certified, Interlake’s modernized fleet of nine vessels deliver raw materials to ports throughout the Great Lakes region.